Alexander Kazantsev- he is very special in writing adventure and scientific imagination stories. Alexander Belyaev- famous fiction pen man, his life is such a wonder, it is as rude as it. Anatoly Dneprov- genius physicist, he is famous for science based writings. Vladimir Savchenko- master engineer physicist, expert about semiconductor. He wrote scientific fiction 'Krishna Taroka' and 'Niruttar Raket'. 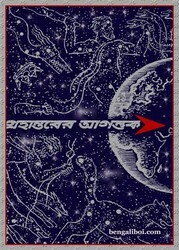 There is five onubad stories in this book and all these translated into Bangla by Nani Bhowmik. The ebook has 222 High Quality pages, 14mb file size.